On:AIR will showcase the work of artists in residence at the Glasgow School of Art, Edinburgh College of Art and Duncan of Jordanstone College of Art from 2011-2012. At the Light House, Glasgow, UK, 10-31 August. Rhona McCallum — Kirsty Fraser – Bekki Churcher — Emily Knight — Mariko Sumioka — Kathryn Hinton — Alice Bo-Wen Chang — Auste Arlauskaite — Filipa Oliveira. 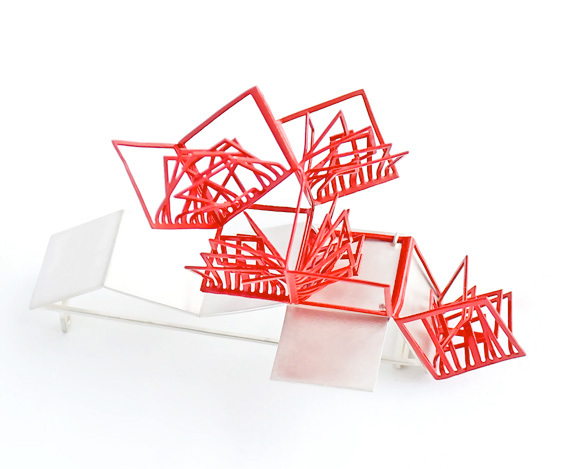 Bekki Churcher – « bishop » Silver & enamel neckpiece. Geometric frames with geometric granulation detailing with a slide clasp. Rhona McCallum – Marram Neckpiece II (2011) Brass, oxidised white metal, thread.